It’s Monday, woohoo! Because we are obsessed with beauty vloggers and one of us secretly wants to be one (bet you can’t guess who) we decided it was time for our…. 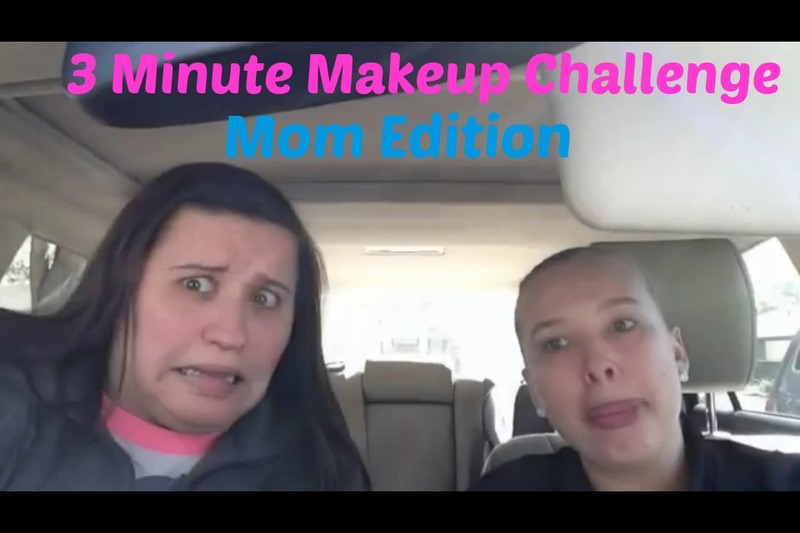 3 Minute Makeup Challenge: Mom Edition. One of us is a cheater (Michelle) and did not put on her full face of makeup because in reality that would take 5 million hours. But whatevs! So tell us, how long does it take you to put your face on in the AM? Are you makeup obsessed like Michelle or not into the hype like me? Also, what are your quick makeup must haves? Michelle shares some of her fave beauty tips here that you should check out as well. soooo much to say about this video!! 2. Channing- never set foot into my bathroom or closet because my collection will give you a heart attack. 3. Channing- if I had lips like yours I would be wearing bold lipstick ALL THE TIME. Bottom line, everyone is allowed to have their interests and give themselves a splurge! Want to buy yourself a purse? Great! Clothes, cupcakes, crafts, decor? For me, makeup is my treat. Also!!! Channing, using some light pink and champagne colors on your eyes would really help brighten them up! Not that you don’t have bright eyes because you’re pretty!! and then a midtone light brown in the crease for definition. That’s it! You’d be surprised how much you would like that. There are some awesome drugstore palettes you could get to help with that. I am DEFINITELY on the Channing side of the make up debate. Almost everything she said, yes, me too. I get anxiety from spending money on makeup. I buy it about every 9 months as well. I feel weird in eye shadow and lipstick. I don’t wear blush. My every-day face is foundation, powder, eyeliner, mascara. And chapstick. 🙂 I could apply it in a minute if I needed to. If given the choice between a beautifully made up face and sleep, I will always choose sleep. I’m just thankful that Michelle and Megan will still be my friend. This is what y’all need to do. Have Channing and I do our every day face and take a picture. Then take it all off and have Megan do our faces the way SHE would do our every day face. Then take a picture. We will display them side by side so people who are like Channing and me can see the difference.